https://sep.yimg.com/ay/yhst-33477391359232/yellow-tang-hawaii-zebrasoma-flavescens-yellow-hawaii-tang-yellow-sailfin-tang-9.jpgYellow Tang (Hawaii) - Zebrasoma flavescens - Yellow Hawaii Tang - Yellow Sailfin Tang EasySemi-aggressive75 Gallon9.7 inchesYesHerbivore, Greens, Pellet, FlakeCentral and South PacificAcanthuridaeSmall 1" - 2"
Yellow Tang (Hawaii) - Zebrasoma flavescens: The Yellow Tang, also known as the Yellow Hawaiian Tang, Yellow Sailfin Tang, or Yellow Surgeonfish are the hardy tang variety, which is commonly found throughout Hawaii. This Surgeon member has a beautiful slender, disc shaped, yellow colored body with brightly colored fins. Just like its counterpart Yellow Tang Tang fishes colour fades by night. However when active, they get back into their original sulphur-yellow colour. When the Yellow Hawaiian Tang is either inactive or intimidated by predator it camouflages itself to protect from the predators. During this phenomenon, the Yellow Tang develops a distinct brownish patch.in the middle of its body sides followed by a plane horizontal white band .This hardy fish has a long snout like mouth and feed mainly on algae. Sometimes their dorsal and ventral fins extend out of the body to give an arrow shaped appearance. 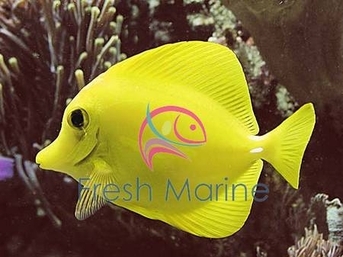 Among all the varieties of tang, this Yellow Tang is exported in large quantities and it is the most popular. These Surgeon fishes get along well with its counterparts only when all of them are introduced into the aquarium at the same time. But it is always advisable to have only one Yellow Tang in the aquarium because; sometimes they become aggressive and slap each other by using their blades below the tail. Generally, Yellow Tang is easy to maintain, but utmost care must be taken to protect them, from contracting saltwater Ich diseases. To avoid this, tangs are generally kept in a quarantine tank for two weeks. Sharp white razor spur near the tail of the fish may hurt you while handling it. To maintain its bright yellow colour the fish has to be fed on strict herbivore diet, but never over fed. It is observed that the Yellow Tang reproduces by group spawning. Maximum Size: The Yellow Tang grows up to 8 inches. Habitat: Range: It is commonly found in shallow reefs, from 2 to 46 m deep, in the Pacific and Indian Oceans, west of Hawaii and east of Japan. Feeding and Diet: Wild grasses, algae, lettuce, and other plant life in general. The Yellow Tang can also be found eating shrimp and other smaller animals. They are almost fully herbivores.